You’ll experience taking baby for a walk at a whole new level. Not only will you incorporate total body toning into your walk, you’ll bond with other moms—and probably get a much-needed breath of fresh air and a good dose of fun. You can still attend these group workouts as your child grows into a toddler—to them, it will become play time with the other young children. Most locations nationwide offer outdoor classes. Stroller Strides incorporates the environment, resistance tubing and the stroller to get an all-over body workout in 60 minutes. 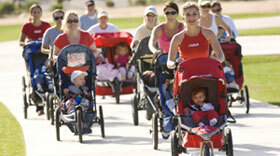 To sign up for a free Stroller Strides class, use the Class Locator to find a location you'd like to attend. Once you've found a location, fill out that class location's free class sign up form. Click Here for Complete Information and to locate a Stroller Stride Program in your area.